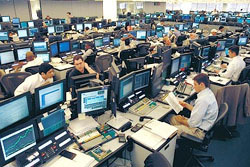 El Segundo, Calif./April 22, 2001- Business consulting and system integration firm Syncata (http://www.syncata.com/) has deployed a secure online portfolio review extranet for J.P. Morgan Partners, LLC (JPMP), a global partnership with over $24 billion under management. The extranet gives JPMP’s analysts, affiliates and portfolio companies direct access to critical investment data, as well as the ability to update and review investment portfolios online. JPMP expects the extranet to increase the speed of their portfolio review process by 60 percent to 70 percent. "Now our investment professionals anywhere in the world can get real-time information directly from portfolio companies. That has optimized our business process,” said Edward O'Connor, J.P. Morgan Partners, Chief Information Officer. Deployment of the online review application, which features fiscal year quarterly financials, corporate profiles, contact information, current officers and board members for the entire JPMP portfolio, which is made up of 13 core affiliates and over 1000 portfolio companies, was completed in under 90 days. The extranet also features an open comments field where companies can cut and paste stock charts, web links, photos and text in virtually any format to give analysts a well-rounded picture of their performance prospects. A horizontal approval mechanism was also created, so once a portfolio review is submitted by JPMP analysts or affiliates, email notifications are automatically sent to JPMP partners associated with those investments. Separate login/security has been designed for portfolio companies, so they can update their financial information on a quarterly basis, regardless of their fiscal year-end month. JPMP has a global presence, so non-US portfolio companies can enter their financial measures in their local currencies. “By centralizing the intellectual capital we use for investing, J.P. Morgan Partners is able to take better advantage of the latest information technology to reinforce our global network of analysts, affiliates and investments, ” said Marcia J. Bateson, managing director and chief administrative officer of JPMP. J.P. Morgan Partners, LLC (JPMP) is a global partnership with over $24 billion under management. It is a leading provider of private equity and has closed over 1600 individual transactions since its inception in 1984. JPMP has approximately 150 investment professionals in seven offices throughout the world. Its primary limited partner is J.P. Morgan Chase & Co., one of the largest bank holding companies in the United States. Syncata (http://www.syncata.com) provides business consulting and systems integration services that help companies plan and implement innovative demand and supply chain solutions. We help clients collaborate effectively, plan adaptively and respond rapidly to enhance business performance and realize measurable value. Syncata assists clients in assessing strategic options and guides them through the detailed process, change management and technology issues involved in delivering a practical solution. Syncata has over a decade of experience working across various industries including automotive, high-tech manufacturing, financial services and insurance.